There’s a bit of a thing going on between Rough Crafts and MV Agusta at the moment. 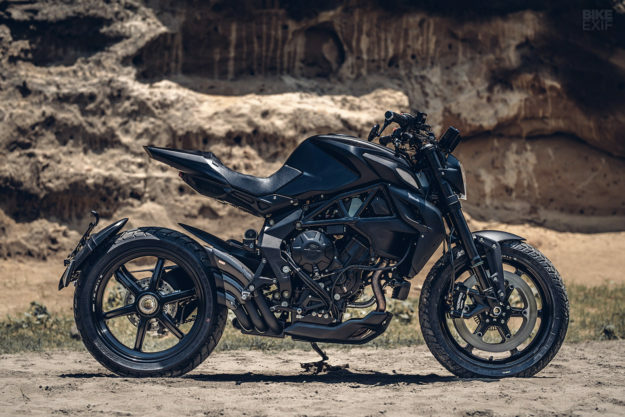 A few months ago, MV Taiwan commissioned builder Winston Yeh to work his magic on the Brutale 800 RR, and the controversial ‘Ballistic Trident’ was born. 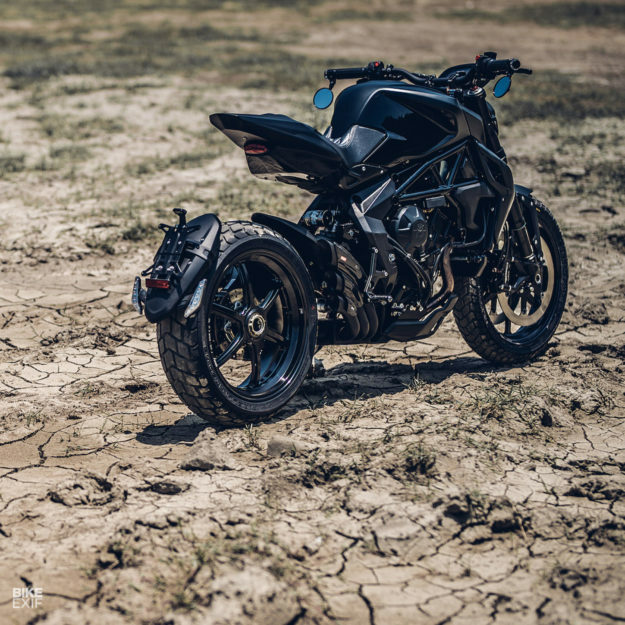 And now we have ‘Guerilla Tre,’ a street scrambler based on the Dragster 800 RR. It’s not hard to fathom the appeal of the modern-day ‘scrambler.’ If you spend most of your time in the city, an agile runabout with an upright riding position and classic proportions ticks a lot of boxes. It may irritate pedants, but these days a scrambler shouldn’t really go anywhere near the brown stuff. 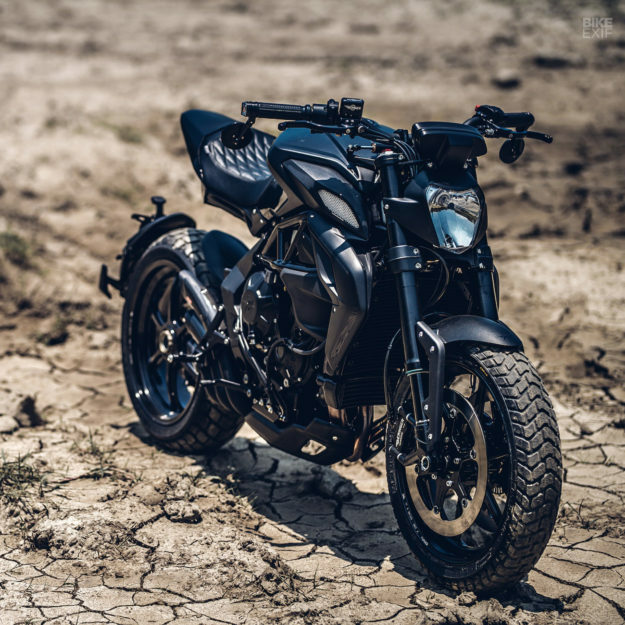 Unless you’re looking at a Scrambler Ducati Desert Sled, it’s best to restrict your off-road ambitions to the odd curb or gravel road. 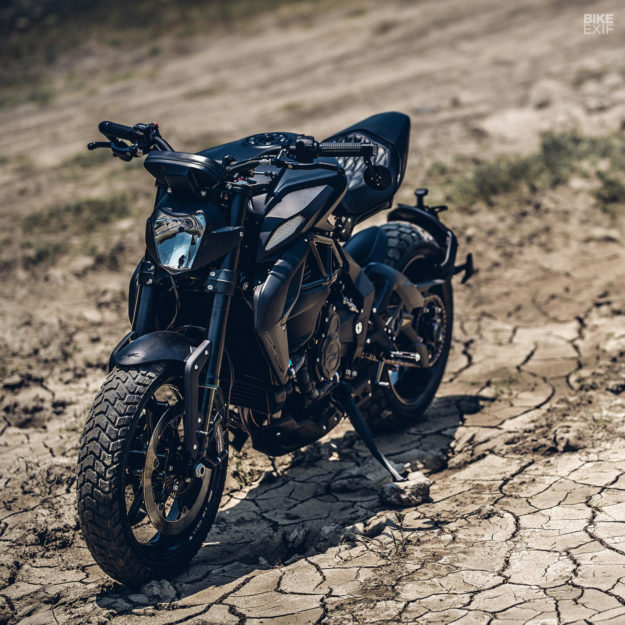 This latest Rough Crafts build is an upscale version of bikes like the Triumph Street Scrambler and Yamaha XSR700. Except it has considerably more power and wallet-lightening ability. 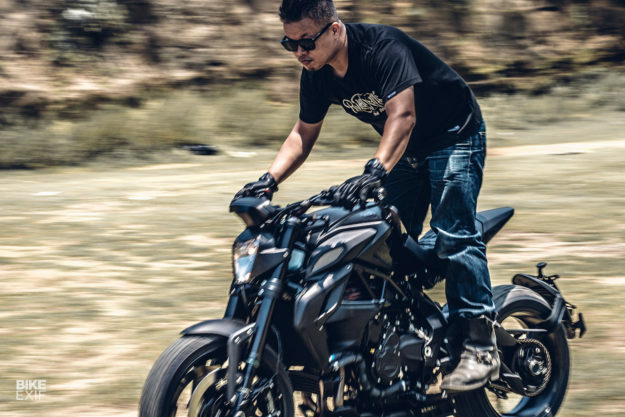 ‘Guerilla Tre’ is based on the RR version of the Dragster, which means it gets a larger airbox, bigger throttle bodies and twin injectors—which boosts output to 140 horsepower. The torque curve is relatively flat, providing solid oomph from around 3,000 rpm, so there’s no need for engine surgery. A stunning HP Corse ‘Hydro Tre’ exhaust system adds visual drama but the biggest change is to the tail section, which is short and waspish. “It’s a ‘tracker’ inspired design and ties the whole look together,” says Winston. It also hides a discreet custom shock from GEARS. To get more scrambler-style rider ergonomics (read: comfortable), Winston has fitted his own custom risers for the bars, which are an ACCEL motocross bend. 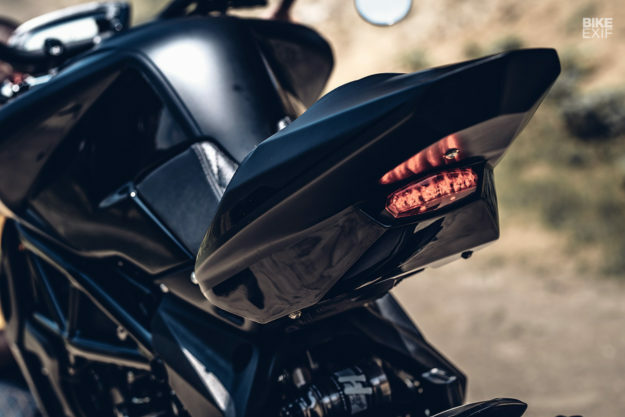 The master cylinders are upgraded to Beringer, along with the brake calipers front and back, and Motogadget supplied the classy mirrors, grips and bar-end blinkers. There’s a custom headlight too, more angular than the round factory Dragster unit, but better suited to the lines of the bodywork. The Rough Crafts visual signature is distinctly noir-ish, so Winston has anodized the gold fork tubes in a deep black. He’s also installed Beringer front discs and, using drawings supplied by Beringer themselves, has made his own black-finished disc carriers in a pattern to match the wheels. 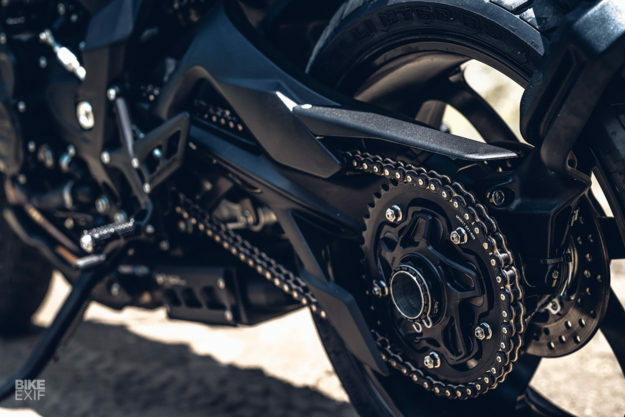 There’s a custom-machined black rear sprocket to match, from AEM Factory. The wheels seal the deal: as with the Ballistic Trident MV, they’re gorgeous 17-inch forged aluminum six-spoke rims with a vintage vibe, built by Wukawa Industry. And finished in black, of course. To our eyes, the result is more coherent than the showroom bike, which mixes shades of black, grey, silver and red—plus gold on the forks. 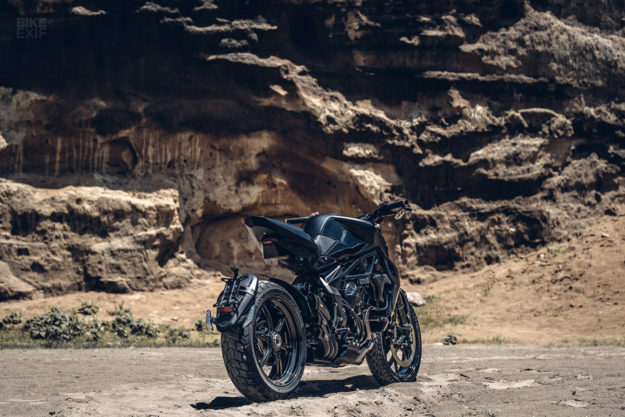 It looks like MV Agusta were thinking along the same lines themselves, because the RVS limited edition is also murdered out. “This is the first Rough Crafts bike where we had to work around existing components,” says Winston. “I have to admit it’s challenging.” But that beguiling Rough Crafts vibe is all present and correct, and we’d put this one in our garage in a shot. 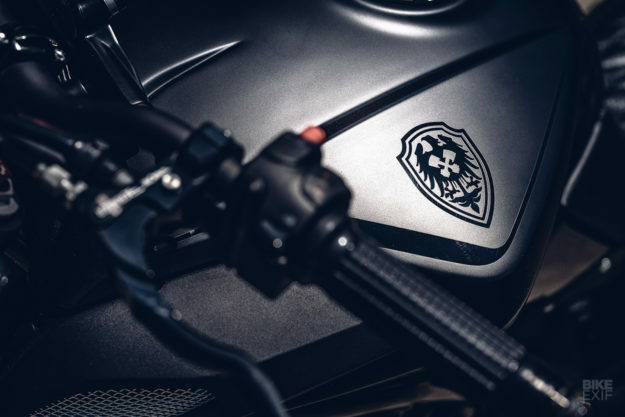 ‘Guerilla Tre’ lifts the street scrambler genre to a whole new level.